We visited Twinlakes Park during the May bank holiday. It was a sunny day day and as you would expect on a public holiday was pretty busy, although fortunately the queues were not too bad. 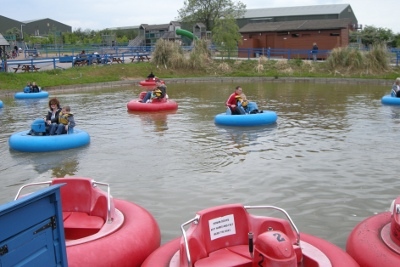 Twinlakes is a family theme park located near Melton Mowbray in Leicestershire. We took a picnic with us rather than buy lunch at the park. There were plenty of outdoor picnic tables as well as indoor areas if the weather was not quite so good. If you don’t bring your own food then there are fast food outlets, but we didn’t look around all the outlets. In fact one of the things about our visit is that we didn’t look around the whole site as there was so much to do to try and fit it all into one day. The day before visiting Twin Lakes we had visited Umberslade Children’s Farm so we had already made the decision to skip Red Rooster Children’s farm within Twinlakes, but as a result we also missed out on some other activities so there is still more to do for our next visit. One of the attractions that we wanted to go on was the Iron Moose Express Train as our toddler son is a big fan of trains. The programme listed only two train times per day which we were very surprised about. Fortunately as it was a public holiday it was running more frequently, but I believe on less busy days then it’s something you do need to schedule. The stations at each end were functional, although they appeared to be only a basic structure and no platform. From the map I expected the stations to be themed, but that was not the case. Still we enjoyed the train ride. We then explored some of the outdoor rides such as the roller coasters and pirate ship. I was surprised by some of the minimum height requirements for the rides which are higher than similar rides at other locations. 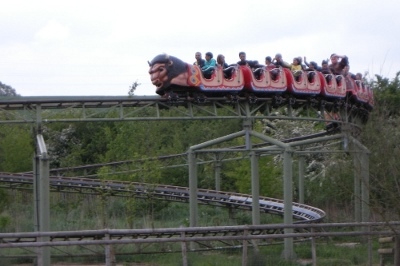 For example the caterpillar roller-coaster had a minimum height of 0.9m and the buffalo roller coaster had a minimum height of 1m but a similar ride at Drayton Manor Theme Park (and Thomasland) allowed smaller children as long as they are accompanied by an adult. I don’t know why the difference in rules and I’m not going to complain about something that is no doubt in place for everyone’s safety, but I did think that may have caused a bit of upset had he not been able to go on a ride he’d already been on and really enjoyed elsewhere. Fortunately our son was however over 0.9m which is the minimum height for most of the larger rides as there is not in the way of thrill rides for children under 0.9m. Note however that children under 0.95m tall are admitted free of charge which does help compensate. The theme park caters best for children aged about 4 to 10, but there are still a few rides that older children and adults can enjoy. This includes the buffalo rollercoaster and pirate ship already mentioned, but also the Trauma Tower indoor vertical drop ride. There are a number of rides for younger children inside one of the other buildings. 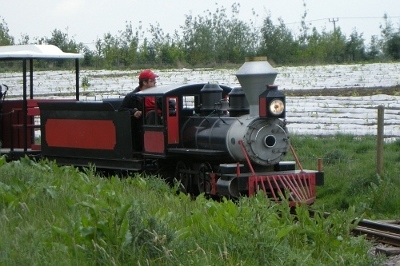 This included a mini-train ride, a mini-pirate ship, barrel boat ride and bouncy castle. There is a huge indoor play area for children over 0.9m high. It’s great fun for older children and I had a great time too. There are giant slides, vertical drops, cargo nets and high level rope bridges. It’s a great way to burn off any spare energy that the children have. One attraction we did experience a long queue was the bumper boats. 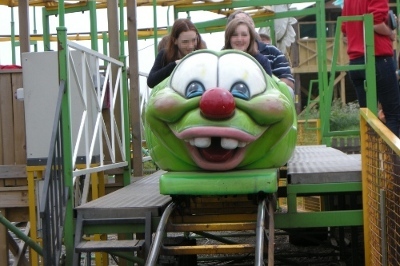 It is a low capacity ride and was very popular. Our son really enjoyed the boats and has talked about it for days afterwards. A significant number of the attractions are indoors and there is still plenty to do regardless of the weather. Obviously there are rides and attractions for which good weather is desirable, but it’s one place where you can go in bad weather and still have a great time. There is lots to do at Twinlakes, especially for children over 0.9m high. Lots of the activities are indoors so worth visiting whatever the weather. Entrance fee is good value for money considering the number of rides and attractions. We’ll certainly be returning to Twinlakes again in the future. This entry was posted on Tuesday, June 8th, 2010 and is filed under Babies, Children, Days Out, General. You can follow any responses to this entry through the RSS 2.0 feed. Both comments and pings are currently closed.